I would have made it available earlier, but the University took three months reviewing it, and I wanted them to be done with it first. This thesis presents a framework of techniques for interactive synthesis of highly ﬂexible character locomotion. The system uses a set of example motions primarily in the form of keyframed or motion-captured walk and run cycles. The system automatically analyzes each motion at design-time and extracts parameters such as impact and lift-off times for each foot as well as overall velocity. At runtime the system ﬁrst blends the motions according to the current velocity and rotational velocity of the character, it then adjusts the movements of the bones in the legs by means of inverse kinematics to ensure that the feet step correctly on the ground. The system works for both human and non-human characters with any amount of legs and in whatever style the provided example motions are in. It can adjust animations made for a speciﬁc speed and direction on a plain surface to any speed, direction, and curvature, on any surface, including arbitrary steps and slopes. Notable innovations in the thesis include the introduction of the concept of a footbase, which is a single combined heel and toe constraint that can retain the important information about the alignment of a foot relative to the ground; the calculation of a supporting ground height that can be used to produce motion with a good sense of weight, regardless of the number of legs and of the gait style; the calculation of natural-looking foot alignments that works for just about any characters and gait styles, and a scattered data interpolation algorithm that has desirable properties when interpolating motions with different velocities. The thesis has plenty of diagrams and illustrations to help presenting the new concepts and techniques. The accompanying videos also help in that regard. That said, I'm very happy to finally be done with this academic endeavor. This also marks the end of the almost exclusive focus on the Locomotion System on this blog. My future blogging here will probably be centered around more broad game development related subjects, though I won't be shy of occasionally diverting even from that topic if I should feel like it. As always, the Locomotion System itself can be downloaded here and it is free to use in any Unity game. One of the things that makes the Locomotion System easy to setup and use is the fact that it automatically analyzes the velocities of all the input walk and run cycles and plots them into a velocity map. At runtime the system automatically assign appropriate blending weights to the animations, such that the closest neighboring animations (in terms of their velocities) get the highest blending weights. While developing the system I tested this blending with as few as 2 sample animations (1 idle and 1 walk cycle) and with a much as 9 (1 idle, walk cycles in 4 directions, and run cycles in 4 directions). A user in the Unity community, Chris Mansell Aka. Capnbubs, has now posted an early preview demo of a game he is developing, which utilizes the Locomotion System. In it, the avatar walks and runs with easy in a landscape with cliffs and hills. I've got walk and a run animations, each in 5 directions, three of them mirrored for moving backwards. In other words, walk and run cycles in 8 directions, which makes for a total of 17 animations when also including the idle. The image above depicts a visualization of the velocities of the animations plotted into the velocity map. I only ever tested with half that many animations myself, but the automated analysis and the runtime blending based on scattered data interpolation ensures that it still just works out of the box. Also, the built in ability to make an animation double as its backwards equivalent means that Chris effectively got 17 animations although he only made 11. Note that the presentation included quite a few videos which are not in the above slides, so a few points may not come properly across if you did not see the presentation at GDC. GDC may at some point make a recording of the slides available, complete with audio. I don't know if that would also include the videos I presented. I'm not so sure of the details. If anybody finds out, please let me know! The new version has several improvements and bug fixes that prevents some problems that some people were experiencing, and which make the motion smoother in certain cases. It also has a new scene file for improved visualization of the motion curves that are automatically analyzed by the system. Version 2.5 of the Unity game engine and authoring tool has finally been released and is now for the first time available on Microsoft Windows too. Unity is the engine I've used to develop the Locomotion System with. Unity is gaining popularity like mad these days and has been used for so many cool games for Mac, Windows, web browsers, iPhone, and Wii. Besides Windows authoring support, Unity 2.5 primarily bring improvements to the authoring tool, including a fully customizable tabbed interface and improved support for creating custom editor windows. 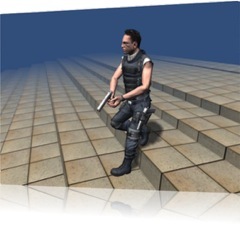 I also work for Unity Technologies now, and we'll be proud to show off Unity at GDC 2009. We'll be in booth #5110 in the North Hall. Locomotion System at GDC 2009! I am honored to be presenting my work in the company of the great minds of the game industry at such an early point in my career. This is the second time I am going to GDC and I am truly looking forward to it. Now, since I'm updating the blog anyway, I have thrown in the latest version of the uneven terrain demo that I have used as a testing bed for the Locomotion System. New in this version is a coyote, as well as lots of visualization options that you can play around with to get an idea of the inner workings of the system. This is the same version that was used for the Video Demo 2 of the Locomotion System in the previous post. You can control the characters with either the keyboard or with a game pad. With a game pad, such as an XBox 360 controller, the direction and speed can be controlled precisely with ease, while independently controlling facing direction with the secondary stick. In this demo the terrain can be dynamically controlled with the sliders at the top. You can create stairs, slopes, and various combinations. The terrain will reflect the changes once the character has walked a little distance to the left or right. Enable manual mode to control the character yourself, as described above. This demo uses four animations for walking (forward, backwards, and sideways) and also four for running. I have moved from Aarhus to Copenhagen (both are cities in Denmark; Copenhagen is the capital) together with my girlfriend. I have started working at Unity Technologies, a company making an extremely cool game engine and authoring tool called Unity. I am still working on finishing my Master thesis about the locomotion system ... it will hopefully be done soon! That's it for now. I hope to see you at GDC!